As we stuck our heads out of the tent the scenery was stunning. 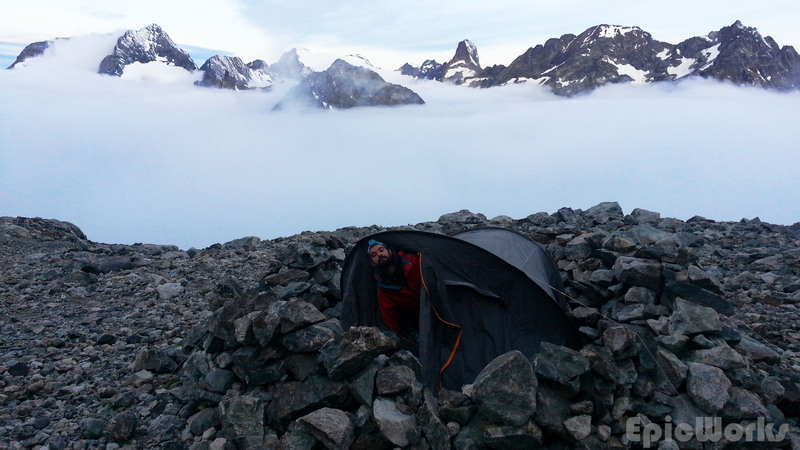 Clouds floated in the valley, with the sharp peaks of the Ecrins jutting out of the white sea. A flicker of light on the snow slope told us someone was already climbing. We were late! Stunning! Get up, get up! We had saved the weekend for some time, and after our Traversé du Vercors, J. and I were looking forward to some hiking or trekking. Although we had originally planned something in Switzerland we decided to keep it for a further date and changed to the French Alps. This was easier for me, but after a long week, Friday came and I still hadn’t found a worthy destination. 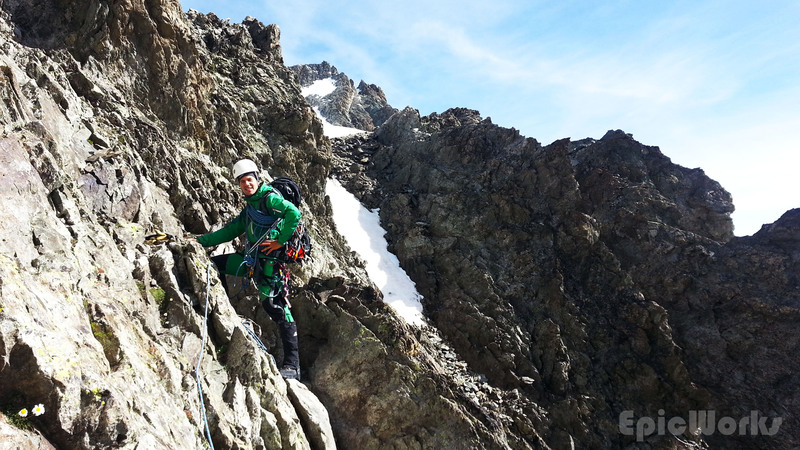 J arrived from Geneva, and after some discussion I pitched the possibility of climbing Pic Coolidge, in the Ecrins. As he hadn’t ever done any alpinism, I was a bit dubious, but he readily assented and so we prepared our kit. Saturday morning saw the last details and we were off. Destination: La Berarde. Where else? R & J. Ready for action! As it was late in the day for any serious peaks, we walked up the valley, past the Refuge du Carrelet (now with donkeys!) and kept going towards the Glacier de la Pilatte. The valley looked so different from the last time I was here. Everything was green and pleasant, although the snow plastered walls high up told another story. After a bend in the valley the glacier was right in front. The melting ice is the source of Veneon and it’s the heart of the Ecrins. 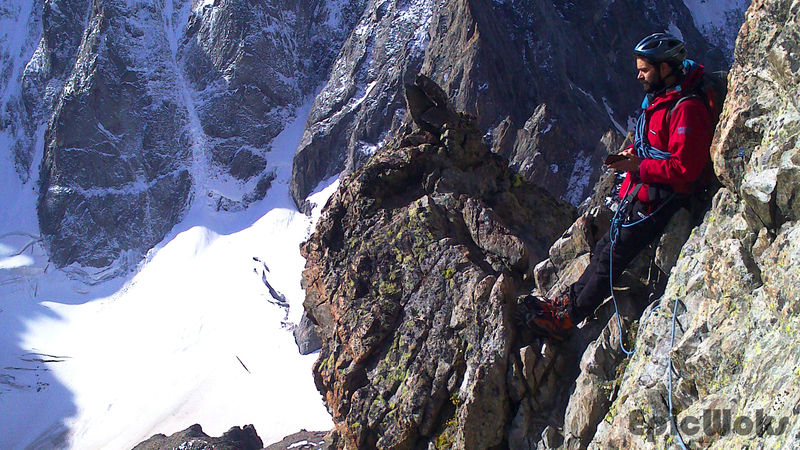 There is a classic route which takes you up to the top of the Pointe, zig-zagging through the glaciers. We didn’t have time though, so having decided to do it as soon a possible, we turned around and headed up toward the refuge du Temple. 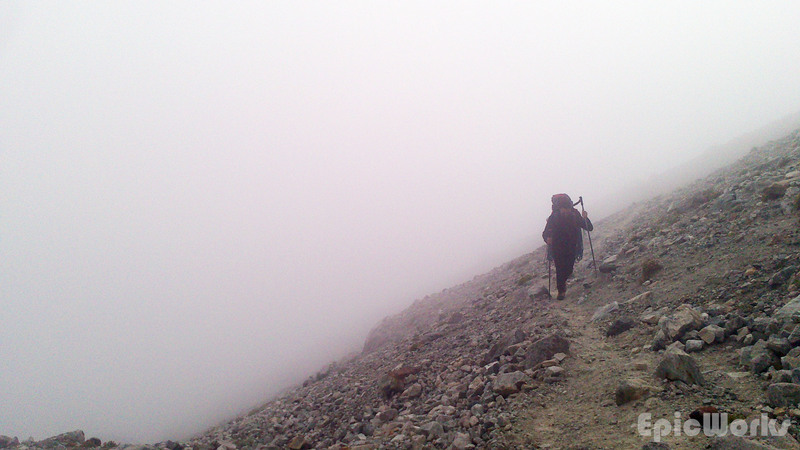 Once getting there we decided to keep going, to try and minimise the climb the next day. A small sandy path curves around the mountain and up into the next valley. Looking down the slope falling away at our side, we hauled our heavy bags yet another steep slope. 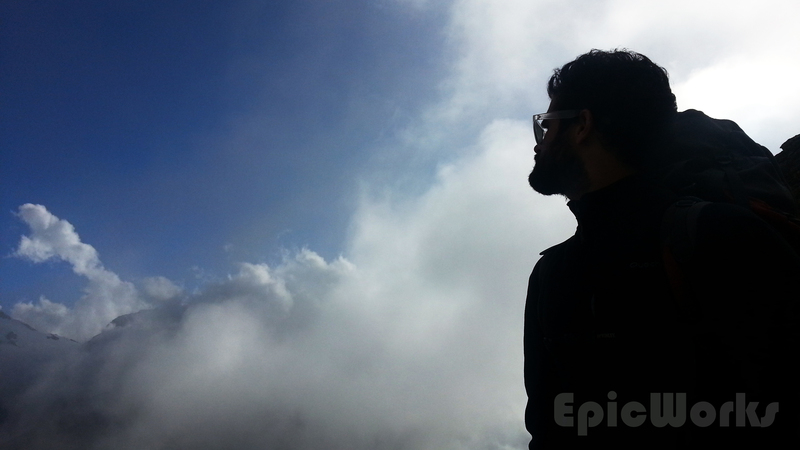 As we went up we were enveloped in clouds, and could hardly see before us. Next morning, having overslept, we set off after one of the several groups that had already started the climb. We were actually the last ones going up. This was going to set the tone for the rest of the day! A few hundred metres up the valley we came the long snow slope going up to the Col du Temple. Crampons on and we started going up. It had been a cold night and the grip was good. Following the tracks we made it to the col. Here we met a paraglider, waiting for the winds to die down so he could take off. It turned out he was the light I’d seen before; the first to climb the col. He’d come all the way from La Berarde that morning! 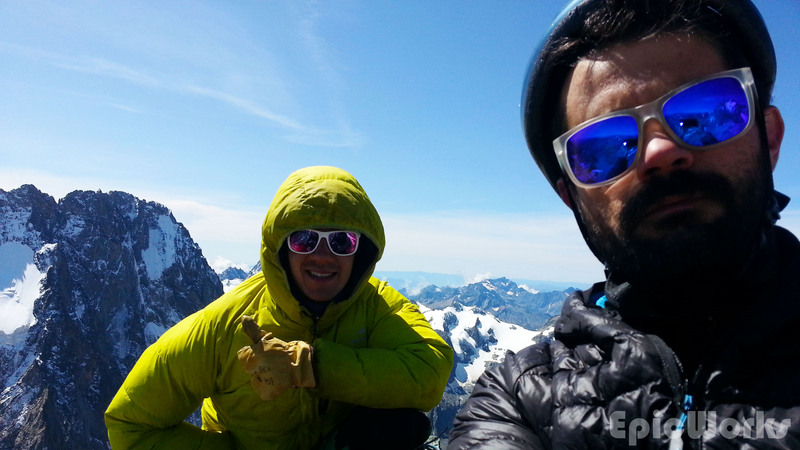 He also pointed out some of the routes he’d soloed on Ailefroide, the massive peak we had in front of us. It was scary just to look at. From here it was the start of the climb for us, so we roped up and set off. 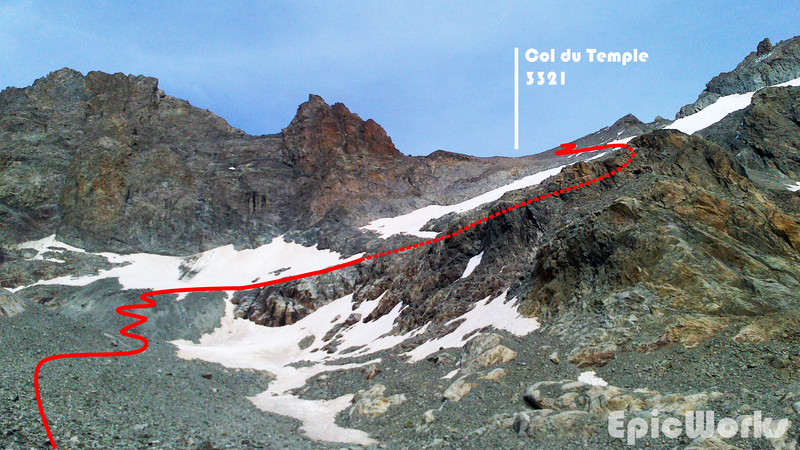 The climb from the col can be broken down into three parts. The first section is rock climbing (if late enough in the season) and edges around right hand side of the peak that can be seen from the col. A steeper section up a gulley is probably the steepest part, and the rock doesn’t offer many places for placing protection easily. J chills on the edge. Ailefroid in the back-drop. 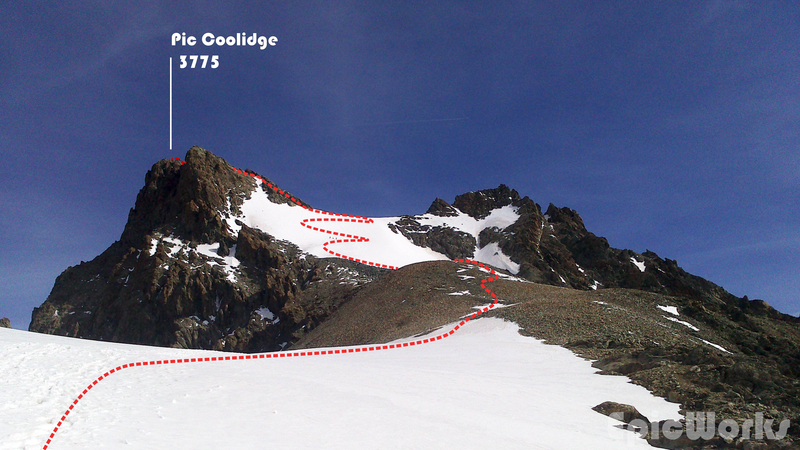 The second part is a hike across a large plateau and up the long snow slope to the base of the rocky peak. Finally the third part is the peak itself, half rock half snow. It’s much more exposed, but is better rock and can be well protected. Going in the lead was great fun, and since a very long time I was really enjoying the steepness. Due to our slow start it was warm, meaning we didn’t need gloves but soon ran out of water. Second part of the climb. Snow and ridge. After we had crossed the snow slope and started up the final ridge, we realised it was a bit longer than we thought. After a first small peak, you need to down-climb a few metres and up to the final tip. Having been so slow I was thoroughly dehydrated, and for a few seconds we doubted about going. Thankfully we pressed on, and in a few minutes were on the top! The view is stunning, and although it isn’t a small peak, Coolidge is dwarfed by the two massive rock faces either side. 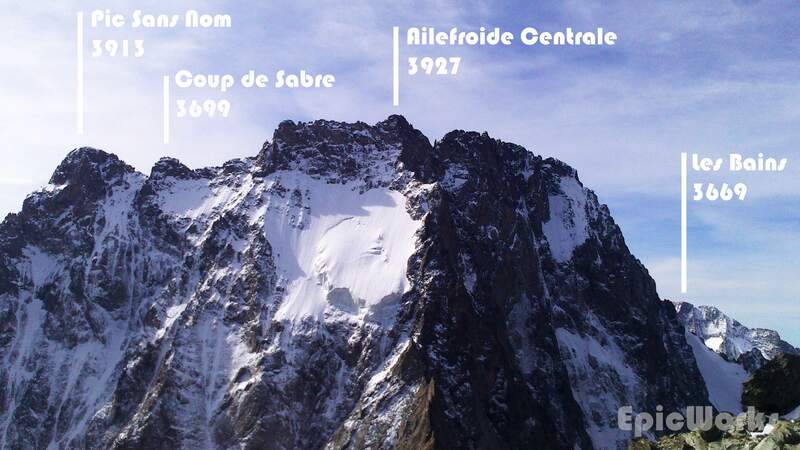 The north face of Ailefroide is beautiful, with its hanging glacier perched on the side. I remember seeing it years ago, on my first trip to the Dôme and wondering how it could stay glued to the side. From close-up it’s even more incredible. On the other side, the south face of the Barre des Ecrins looked down at us from 4000, a massive drop into the Glacier Noir. We could also see the snow–capped Dôme, cheekily sticking out on the side. Ailefroide and Co. Glacier suspendu in the centre! After a snack we were off, leisurely reversing our previous actions, without having to fight against gravity this time. With no major problems we made it back to the Col du Temple. J’s crampon broke on the way down, but luckily the snow has softened (the advantages of being slow!) and he made it down ok. Looking up from where we’ve come. By this point we were pretty tired, and while packing the tent and our stuff we had the +1200 metre descent to look forward too. It didn’t deceive, and by the time we got to the car, our feet were destroyed. Pulling out our headlamps in the car park, it had been a long yet great day of mountains. It had been a first for both us: alpism for J, leading for me!